Dominion Bay is one of dozens of small bays along the South shore of Manitoulin Island. It’s easy to reach by driving across the bridge at Little Current, just 1½ hours scenic drive from Sudbury. 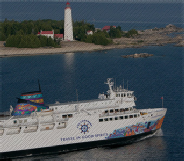 Or you can sail the Chi Cheemaun Ferry from Tobermory - check the Ferry Sailing Schedule and Fares to book your passage. The 2 hour cruise is beautiful experience day or night at anytime in the sailing season (May to October).